High tea and Picasso, when you've had enough Picasso, it must be time for tea! The view across Woolloomooloo Bay from the Art Gallery of NSW's cafe/restaurant is really spectacular - enough to lift one's mind and spirit toward the lofty heights of the finest of fine art - the partaking of tea with a little something. 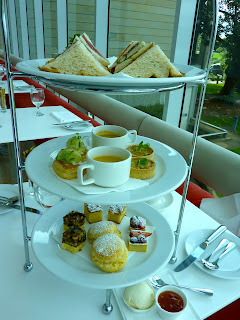 The $55 per person, you get an all-day ticket to attend the Picasso exhibition (which ends 25th March 2012) and High Tea. The exhibition costs $25 per entry, so if we do the math, that leaves a food and beverage allowance in the mid-to-high range of Australian High Tea Price-o-meter. Now, The High Tea Inspectors make a point of following the old adage of "if you can't say anything nice, don't say anything at all". This policy means that we sometimes eat a good deal more High Tea than we review. Given this, I might be a teensy bit bold on this occasion, and note that the service was, unfortunately, not first rate. But really, we all have bad days and therefore this can happen pretty well anywhere you go. Moving on to more pleasant things, the view is divine and the food was very good - it was fresh and there was plenty of it. An interesting and non-traditonal inclusion was pumpkin soup served with a teaspoon - curiouser and curiouser! If you are in Sydney and have the merest artistic inclination, I highly recommend the Art Gallery. I enjoyed the magnificent Australian collections - all beautifully curated. I have a soft spot for "The sea hath its pearls" by William Henry Margetson - so keep an eye out for that. Then when gallery fatigue sets in, take yourself off for a coffee/pot of tea/slice of cake at the cafe and admire this brilliant city.